I thought I would share another shot from our recent trip to Colorado. After our train ride we drove around the little town of Silver Plume. It is an old mining town. I fell in love with this church so we stopped so I could take some photos. I love the mountains in the background and how they are also reflected in the round window. All the little details of the church are so beautiful. Wow, I love that picture! I adore little white churches like that. They just don't make them like that anymore which is a shame. love how your processing makes it look like such a vintage shot. Gorgeous! Great processesing. Isnt it amazing how one little building can give you such inspiration? It makes me wonder the history of it. I love the cloudy darkness of the sky in back too. i love the texture you put on there, too. really enhanced the mood! LOVE it! Processing, Texture, everything! Oh my Jen, this is spectacular! 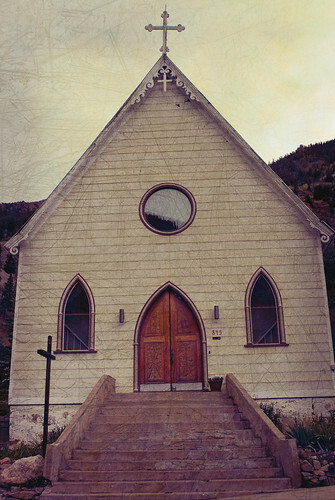 Such a lovely little church nestled in the mountains, and your vintagey processing and texture really makes it so sentimental. Great photo, and great processing! I need to remember that it's ok to take the time to stop every now and then for a shot. Thanks for the reminder! What is it about old buildings that just draw us in (and draw out our camera's from our bags!). Great shot and wonderful processing on it. Ohhhh...love this! I like the processing on it too - just as it should be. We found an old church like that in Hawaii too...they make the best photo subjects! I love churches like this too. Very cool processing. Isn't Colorado beautiful?